No one is more knowledgeable or better equipped to maintain, inspect and repair your sewer system than The Lake County Sewer Company. We are the most reliable environmental contractor in Northeast Ohio. 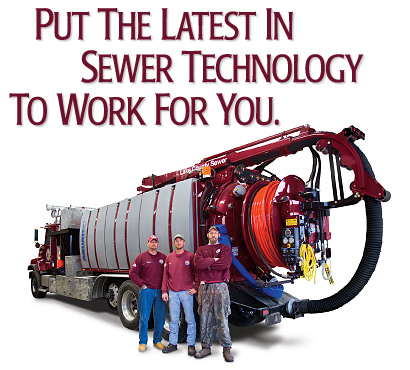 Lake County Sewer has the finest fleet, and the most advanced sewer cleaning, inspection and rehabilitation equipment ready to work for you. Experience at all levels of the company. We are staffed with a team of people, inside and out, that have spent most of our lives in the business. When you call us, you will always talk to a knowledgeable person to help solve your sewer problem. And, when you contract with The Lake County Sewer Company, you will be serviced by crews that come to the job site with decades of sewer experience. Work completed on schedule, with accurate reporting. We deliver what we promise. We pride ourselves on getting the job done on time, with accurate reporting and paper work, eliminating unnecessary mistakes and expense for you. Site created by Hartzell Inc.